This issue of The Log dedicates an entire spread to Dog Aboard. Photos are typically printed in the order they are received. With so many great submissions, however, this content editor could not wait to share such canine cuteness. 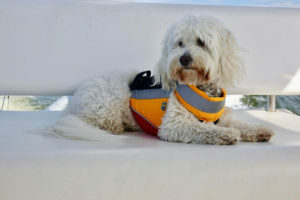 A 4-year-old Miniature Labradoodle, Annie is seen here aboard Pam and Craig Watkins’ 42-foot Ocean Alexander Classico while cruising south on the Intra Coastal Waterway (ICW) from Charleston, South Carolina to Jensen Beach, Florida. This was her first voyage on the ICW, the Watkins relayed, and her favorite activity was spotting dolphins. 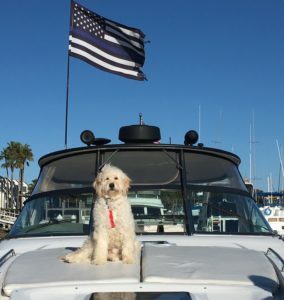 Benny, a Miniature Goldendoodle, is pictured here at 8-months-old aboard the Black Pearl, a 2002 460 Sundancer docked at the Hyatt Mission Bay in San Diego. Benny enjoys napping in the sun, greeting everyone as they come down the ramp and occasionally dipping his paws in the water. 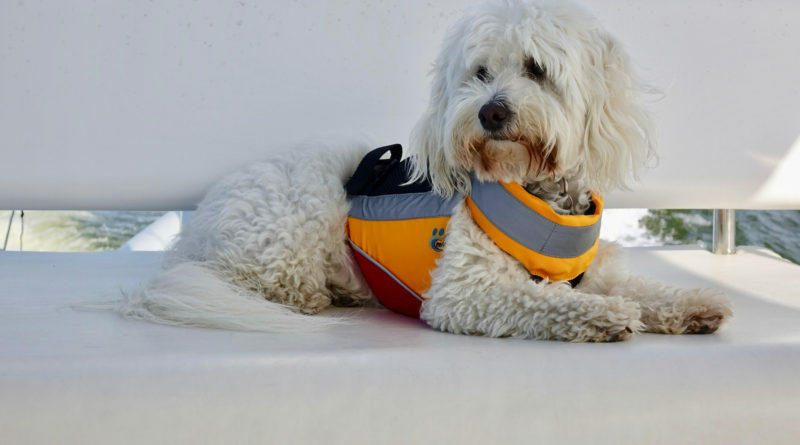 He wouldn’t trade his nautical life for anything, according to his owner Rachel Franco. 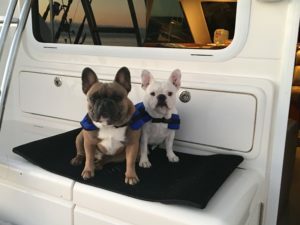 French Bulldogs, Shamus and Stassi, love boating on Mike and Gina Haase’s 42-foot Riviera, Tight Riv. They have cruised aboard Tight Riv around the Channel Islands out of Oxnard. 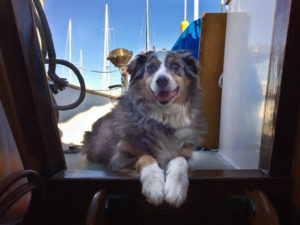 Cosby, an 8-year-old Australian Shepherd, loves spending time aboard the Lil Mess (an Ericson 39B) with his owners, Jim and Barb Messerschmidt. The main hatch is his favorite spot on board. He will sit for hours supervising his owner while they labor at keeping the Lil Mess tidy. 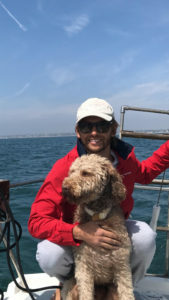 Pilot loves to jump aboard the boat and cruise the San Diego Bay with José Luis Pérez Rocha and his family. 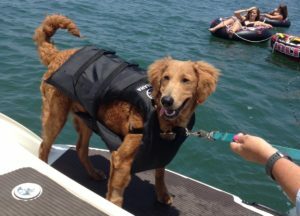 This 1-year-old Goldendoodle is also keen on plunging into the water with Rocha’s teenage daughters. 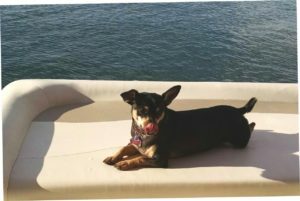 Lilly, aboard the good ship Poker Money, a 48-foot Hatteras in the Channel Island Marina, is on the lookout for harbor seals. She is an 11-year-old Labradoodle. Crystal is picture here sunning in the cockpit of SV No Problem at Southwestern Yacht Club in Point Loma. 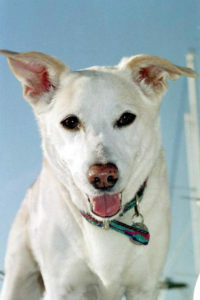 Crystal, a white American Shepherd, loves to sail with her skipper, John James. Chevy with Jason John aboard his Coronado 35, sailing towards Newport Beach from Long Beach. 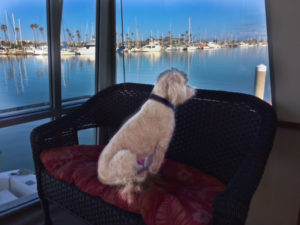 Chevy, a 3-year-old Labradoodle, traveled all the way from Melbourne, Australia to Long Beach, California. “The Queen” is tanning on her sundeck.